Luton ended a disastrous run of form by beating Tranmere Rovers on Monday, breathing new life into their League Two play-off hopes. The Hatters threw away a two-goal lead losing 3-2 to Exeter at Kenilworth Road on Good Friday and it looked bleak for John Still’s side heading to Prenton Park on a run of seven straight defeats. 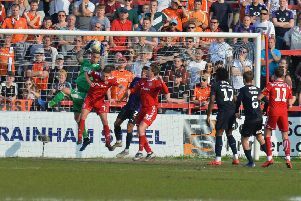 A strike 10 minutes from time by Cameron McGeehan saw Town net all three points and BetVictor think that result could be the catalyst to Luton making one last bid towards the play-offs; 5/4 (from 5/2) with the gap between Luton and those in the top seven cut a solitary point. The Hatters still have plenty of work to do heading into the climax of the season however should they indeed finish amongst those play-off places would boast outstanding claims to be playing League One football next term and are 9/1 with BetVictor to secure back-to-back promotions. There is a 13-point gap to the three sides occupying the automatic promotion places and Burton, Shrewsbury and Wycombe remain odds-on to be promoted – the Brewers the 5/6 favourites for the Title after beating Wanderers 1-0 at the Pirelli Stadium in the week; the Shrews 10/11 and 40/1 Bar. Hatters fans will be familiar with their club doing things the hard way and they can build on the victory over Tranmere when hosting title favourites Burton Albion. The visitors are 11/8 favourites with BetVictor, Town 85/40 and the draw 5/2. Luton are 11/2 to win and both teams to score however appeal at 4/1 with BetVictor to win the game to nil and 8/1 to once again win by the solitary goal.